For Bonding, Laminating, Laminating Items from a Mould or Making Moulds or other components. Reinforcing fibres are well moistened. Ideal for adding fillers such as Micro balloons, Aramid / Kevlar® Pulp, Micro fibres, Super Lightweight Fairing Compound, Thixotropic agent which turns the resin into a Gelcoat for moulding etc. Great for bonding to most materials. Great for bonding to most materials. Also totally fuel proof once cured. Note: Full depth cure / Pot life 40mins / Cure time 24 hours. 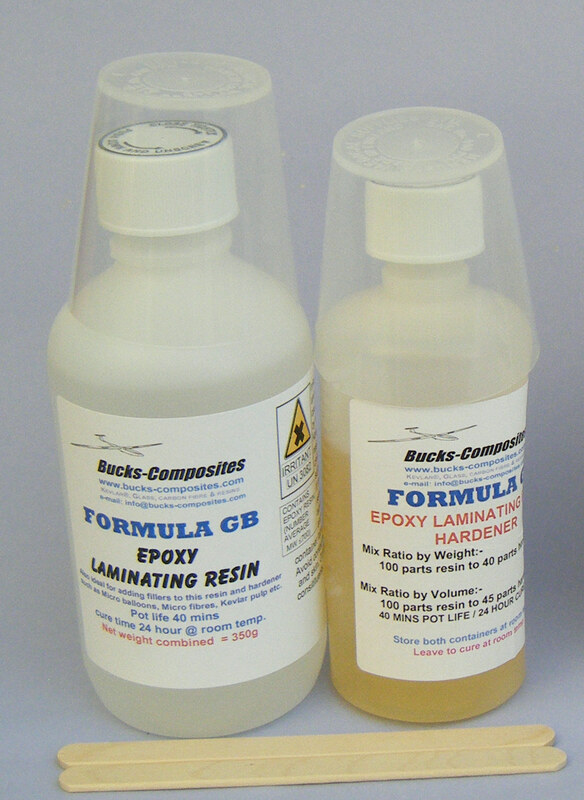 The Formula GB Resin system displays good filler acceptance via it’s low surface tension. Also totally fuel proof once cured. The resin and hardener pack comes with 2 mixing pots & 2 spatula's. Spare hardener can also be ordered. Summer time, Take into consideration heat generation when mixing resin and hardener, once mixed put into a larger area this will prevent higher temperature build up and give you a longer pot life (working time). Never mix large quantity of resin and hardener. Download our handy printable mixing chart from the link below.